Posted By Alan, 12th Dec 2017. 5 Minute Read. ● What is the cause of a dripping tap? ● Taps too old to fix? It’s been a few too many weeks and you’ve been hoping that the drip, drip, drip of the tap will just stop… but it hasn’t! You’ve finally decided to accept that what you have is a leaking tap and now you’re looking around for a solution on how to stop a dripping tap. The most common reason for a leaky tap is a worn tap washer - If you aren’t too familiar with DIY then you may be wondering how to change a tap washer, but don’t worry, we’re going to show you how in 5 simple steps! Please, put down the hammer! Replacing a tap washer is not a big job and it is pretty simple, but before we explain how to replace the washer to fix the leak it’s best practice to familiarise yourself with the insides of your tap first. What is the cause of a dripping tap? In order to understand why your tap is leaking you first need to know how your tap works. 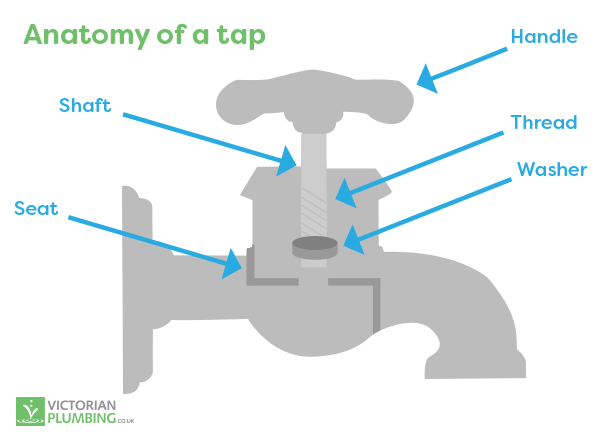 The inside of a typical tap will consist of 2 main parts which control water flow, the seat (or valve seat) and a tap washer. As the tap is turned on it will direct the washer away from the seat and the pressure will force the water to flow through the hollow tap and out through the spout. When the tap is turned off it pushes the washer against the seat creating a watertight seal which prevents the water flowing through. Depending on the type of your tap there are several reasons why your tap is leaking. In most cases, taps leak because the internal washer becomes worn or damaged. This wear or fault with the tap washer fails to create a watertight seal within the tap which allows a small amount of water to leak through creating a continual, and very annoying, drip. The image above identifies a small fault with the seal and the water working its way through and dripping out of the spout. So lets find out how to stop a tap dripping by changing the tap washer. Changing a washer in a tap is a simple process which we have outlined below in 5 simple steps. If the tap washer is damaged and causing your tap to leak, replacing the worn washer with a new one will fix a dripping tap. Please note that the steps outlined below are for standard taps and should be used as a guide only. Not all taps will work in this exact same way so please make sure you check your taps first before following our guide. As with any advice guide, please contact a professional for help if you are unsure of your DIY ability. Before you start make sure you put the plug into the basin waste to prevent small components such as screws falling down the drain. 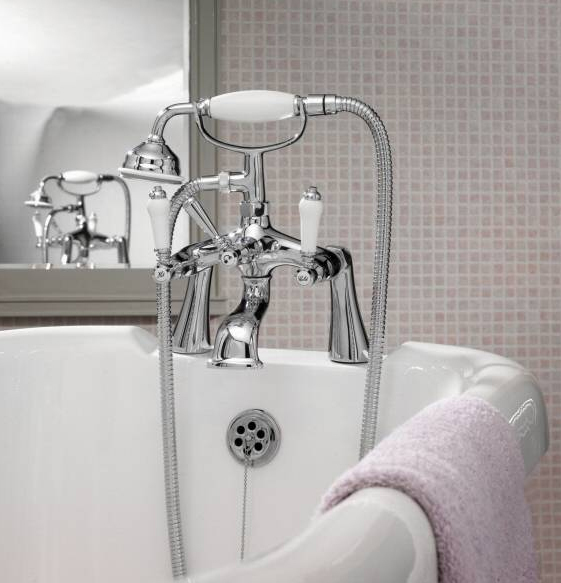 Place a towel inside the basin or bath to prevent any damage from dropping things like tools. This last thing is important as the last thing you’ll want to be doing is buying a new basin or bath! Turn off the water using either the isolation valve underneath the tap or, if you haven’t got a valve, turn off the mains water supply. If the mains hasn’t stopped the water flow completely then you can run the kitchen tap which will take the water away from the bathroom tap upstairs. 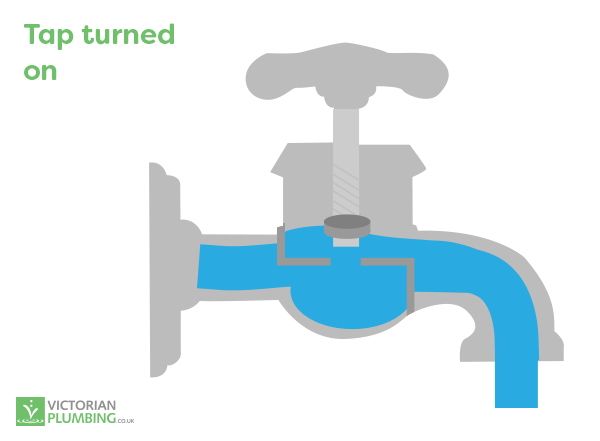 Small amounts of water that reside in the pipes can be drawn out by using turning on the kitchen tap until it stops. Take a flat-headed screwdriver to remove the top from the tap. You’ll probably find a screw holding on the tap head so unscrew this and remove the tap head to expose the valve. Removing this can be tricky so take a spanner and use this to undo the valve. If it is still a bit stiff then hold the tap spout for additional leverage. 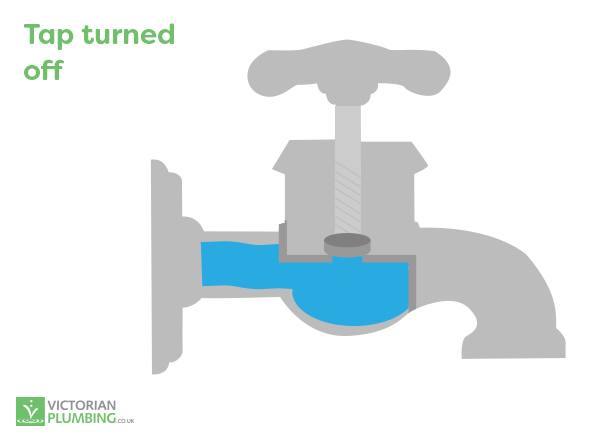 Once you’ve removed the valve you’ll find the washer underneath it secured in place with a screw or a nut. Simply remove this tap washer (feel free to check it over and show the person next to you the wear and tear as though you really know what you’re talking about) and replace it with one the same size. If the washer is secured with a nut or screw then loosen and remove before changing the tap washer. Once you’ve replaced the tap washer it’s a simple case of reversing the steps that got you here. 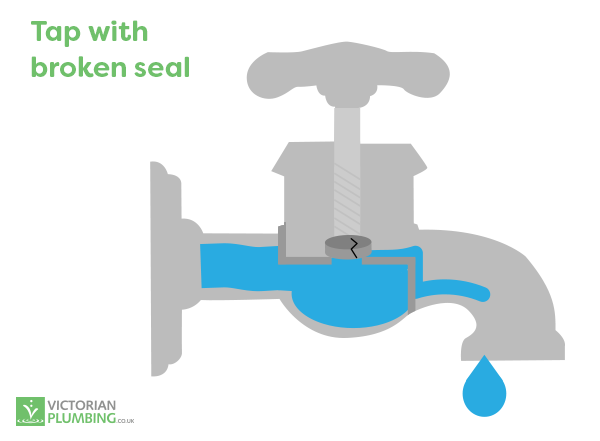 Screw the valve back into place - make sure you don’t tighten it too tight as the rubber seal should secure this perfectly for you so just pinch it up with your spanner. Fasten on the tap body and then finally pop on the top securely. And that’s how you fix a dripping tap due to a faulty washer! Congratulations, you’ve successfully changed a tap washer. If you’ve found this experience totally gruelling and never want to change a washer in a tap ever again then you may find taps with ceramic discs interesting. Unfortunately, there are no taps that promise to never leak but the ceramic discs are extremely hard wearing making them extremely resilient to wear and tear. They still utilise washers which can wear away and break over time but very little movement within this style of tap means there’s less that can go wrong. It also means that you shouldn’t have to change a washer on a tap with ceramic discs as much as you would a normal tap. The ceramic disc lasts much longer until the point where you probably replace the taps before the cartridge. 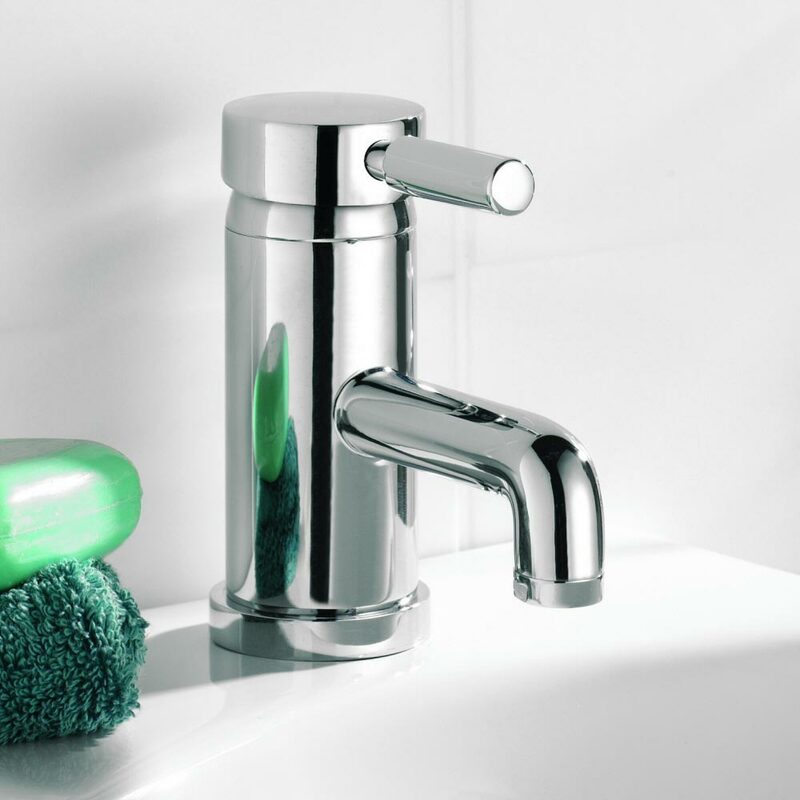 The basin taps and bath taps above are both examples of taps with ceramic disc technology although there are many more on the market. Taps too old to fix? After getting into your taps and seeing more than you bargained for you may be thinking about replacing your taps altogether. Feel free to take a look at our guide on how to replace a basin tap which also has an easy to follow video guide we shared on YouTube. Sometimes a new set of basin taps or bath taps can fix the problem of a leaking tap and also add a refreshing look to your bathroom.